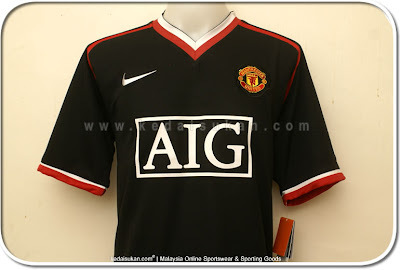 I added a blog here not so long about concerning the new Manchester United away kit for the 2009/2010 season. Well to add some confusion to the issue, there is now another away shirt doing the rounds in black. Added to this are a new home shirt too, just to confuse the issue even more. Anyway I heard few companies will be jersey principal in year 2009. Either Air Asia from Malaysia,Saudi Telecom or Sahara Incorporated from India. So far Air Asia is the closest,but since bid from Saudi Telecom is quite tempting,it will be great too. 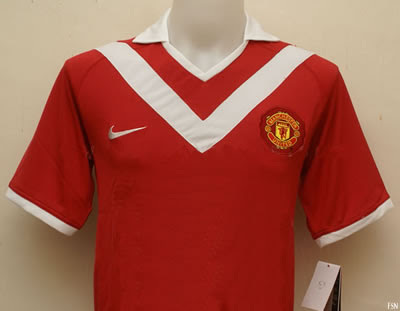 Anyway,as comparison between Sharp,Vodafone and AIG,Vodafone is less sucsessful United but the design were awesome.AIG meanwhile,2 Premier League,1 Champions League,1 World Club Cup,1 League Cup and 2 Charity Shields - but the design were awful.To be honest,I prefer to wear Sharp or Vodafone jerseys because jersey designs. Since AIG already gone bankrupt in this economic crisis,we need new jersey principal to refresh our jersey. I heard dat Hublot the watch company will be our new sponsor.from the next season..is it true carly ?